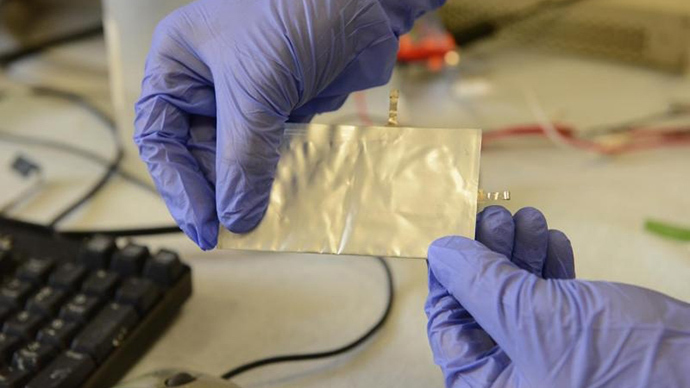 A new battery developed at Stanford may well revolutionize personal technology. It charges in a minute, lasts thousands of cycles and is much safer than current commercial models. Right now it lacks capacity, but its creators say it’s a work in progress. “We have developed a rechargeable aluminum battery that may replace existing storage devices, such as alkaline batteries, which are bad for the environment, and lithium-ion batteries, which occasionally burst into flames,” said Hongjie Dai, a chemistry professor at Stanford. Dai’s team presented their findings in the April 6 online edition of the journal Nature, titled ‘An ultrafast rechargeable aluminum-ion battery’. Their prototype consists of an aluminum anode and a graphite cathode, packed inside a flexible polymer-coated pouch with an ionic liquid electrolyte. “The electrolyte is basically a salt that's liquid at room temperature, so it's very safe,” said Ming Gong, Stanford graduate student and co-lead author of the Nature article. Safety is a major selling point of the Stanford prototype. A video released by Dai’s team shows them drilling through the pouch while the battery continues to function. By contrast, the lithium-ion batteries presently used in most electronic devices can catch fire and explode if damaged. “You can drill through the aluminum battery pouch, and it will continue working for a while longer without catching fire,” Dai said. He also reported “unprecedented” charging times for the prototype, as little as one minute. Moreover, the new battery has lasted more than 7,500 cycles without loss of capacity, while a typical lithium-ion may last up to 1000. “This was the first time an ultra-fast aluminum-ion battery was constructed with stability over thousands of cycles,” the authors wrote. Another feature of the prototype is that it can bend or fold safely, opening up possibilities for wearable electronics and installation in odd-shaped spaces. Aluminum is also much cheaper than lithium, making the battery more eco-friendly. “Our battery has everything else you'd dream that a battery should have: inexpensive electrodes, good safety, high-speed charging, flexibility and long cycle life,” says Dai. There is one problem, however: It only produces about half the voltage of its typical lithium counterpart.